Basically, stereotypes can be either positive or negative, and the majority of people make it a reason to discriminate. However, not a few people assume that all forms of stereotypes are negative. According to the psychologist, the perception in the psychology of the process that occurs within the individual that begins with the receipt of excitatory, until the stimulus is realized and understood by the individual so that the individual can recognize himself and the circumstances around him. This perception can sometimes be created when we see something rare. For example, see foreigner in our area. This perception also arises in the Russian people. Many people have a perception about the Russian people. Basically misconceptions about cultural stereotypes are not only inherent in Russian perceptions of foreigners. However, this error also includes the perception of foreigners against the Russians. This article will discuss about 5 stereotypes of Russian which actually true. This condition is true and real. There are still many Russian people who have communist status. The proof, there is the second largest party in the Duma (Russian legislative body) with 92 seats and 156,528 members of the documented party are adherents of communism. Indeed, a small part of Russian is communist. Seen from the government’s opposition party. Communism is therefore present in Russia. It should be noted, however, that communism is not its current political ideology. Today, vodka is beginning to waver as skyrocketing beer popularity in Russia is rising. This is because beer is considered ‘healthier’ by some people, so the beer stock has increased sales by 40 percent in the last ten years. The condition of russian addicted to alcohol is still an issue in Russia with the number of cases of about two million cases of diagnosis in 2011 according to WHO. To see it, you simply walk on a metro recorder (underground crossing path), or where the homeless people are. In the place there is obviously a problem of alcohol addiction there. However, the case of alcoholism began to decline in recent years. You can also read traditions of how Russia celebrates victory day. 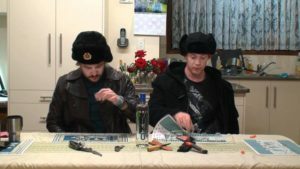 According to the Russian government, in 2010, the average annual alcohol consumption per person in Russia shows extreme data, which is 18 liters. But 2013, the data down to 13.5 liters. This figure is still higher than the number of US annual alcohol consumption calculated by WHO in 2011, which is about 7.5 to 10 liters. Russian residents or people living in russia are not all ethnic Russian. Russia is the same as Indonesia is a heterogeneous or pluralist country. According to Russian government records, with a population census of 2010, Russian ethnic populations occupy the most position of 80.90%. In the population census records, there are details of ethnic non-Russian with the largest population, among others Tatar 3.87 percent, Ukraine 1.40 percent, Bashkir 1.15 percent, Chuvash 1.05 percent, Chechen 1.04 percent, and Armenia 0, 86 percent. Population there are about five million Tatars; nearly two million Ukrainians; and each more than a million Bashkir, Chuvash, Chechen, and Armenian. In addition to these ethnicities, there are still many other ethnic groups, including Tajik, Azeri, Kyrgyz, Moldova, China, Kazakh, Belarus, Uzbek, Vietnam, and Turkmen. Moreover, the illegal immigrants who live in the territory of Russia, especially from Central Asia, which amounts to more than four million people. It is true, if you go to Russia and meet with russians then certainly will not get a smile. In general most Russians say that they will only smile to people who are known, not to foreigners. It has become a norm in Russia to have a serious face in a public place. Russian people will smile when there is a reason and sincerity to be able to smile and think themselves look stupid if many smile without reason. According to psychologists, most Russian people never smile at strangers because of the form of vigilance. This alertness is caused by various historic events occurring in the country. According to him, because Russians often have to deal with outward aggression (both from other nations as well as from compatriots) and they indirectly affect their psychology by getting used to always be vigilant and indirectly believe in strangers. It is undeniable that Russian women look attractive. This is seen when you go to Russia in a public place, many beautiful Russian women with an attractive appearance. In addition to genetic or caucasian genetic factors, the ability to beautify themselves is also the expertise of Russian women. Every Russian woman is required to look attractive and elegant. This is because the appearance of someone shows their identity. When using a good dress then it reflects the character of himself is good. Not a few Russian women pay attention to their appearance, especially women who are big cities. They will always try to wear the best clothes anywhere, such as when to go to work, library, or to the nightclub. Both young girls and middle-aged women also appear stylish as well as those who are young.